On the right we show few of our valued customers. Customers who already had experience with 3D printing before they finally bought one or more dddrop. The cramped build size is one of the most annoying issues with many 3D printers. Actually, it is a problem for most users these days. For this reason dddrop built a professional 3D printer that has the biggest building volume in it’s class: 330 x 310 x 305mm on the dddrop EVO. This huge size allows the user to create big models in one piece, or print many parts in one print job. The dddrop professional 3D printers have a heated print bed. Not just heated… It can reach a staggering 130 degrees Celsius on the dddrop EVO! This high temperature together with the closed casing allows you to print difficult filaments with high glass temperatures, such as ABS and other 3D printing materials. With a temperature this high, they won’t warp and deform. Your 3D printing model stays flat on your printer bed. The print bed can carry massive models. On the dddrop EVO, the heated-bed is very easy to swap for different materials. The print head is positioned very accurate: it makes 3D printing in hundreds of mm’s possible. A 0.01-0.6mm layer height makes building very precise parts possible. The dddrop 3D printers are equipped to build huge models as well as very tiny and small models. Our professional 3D printers are fast: up to 200mm/sec. and reliable! All this precision is useless if it cannot be converted to your product. That’s why the dddrop 3D printers have a extremely stiff box frame, specially developed to turn the precise controls into accurate movements for beautiful products, printed every day! Our customers use the 3D printer for full time production of plastic parts. A robust and reliable machine like the dddrop 3D printer is therfore needed. A big disadvantage of today’s affordable 3D printers is that they have an open casing. This makes printing models vulnerable to changes in temperature during the printing process. The result is warping models, especially for bigger printing models or models printed out of ABS. The professional 3D printers of dddrop have a closed casing that keeps the print room away from drafts and outside impacts, so you have optimal printing conditions in summer but also in winter. The dddrop EVO goes one step further: The print room temperature is controlled, perfect for every print material! The service team at dddrop is manned by experienced 3D printer specialists. People who can offer you fast service in case of any problems. 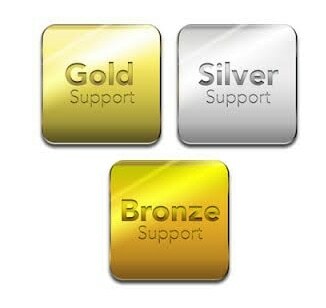 By dddrop you can choose a service plan that fit your needs: Gold, Silver or Bronze. In Western Europe, the dddrop 3D printers are distributed by CAD2M. CAD2M has more than 12 years of experience with sales and support of high end 3D printers and more than 26 years experience in professional CAD/CAM support. The dddrop 3D printers are based on the latest knowledge in the field of 3D printing, backed by solid experience and customer support. We are adding more partners with expertise in 3D printing.